Get ready to start your Missouri course! 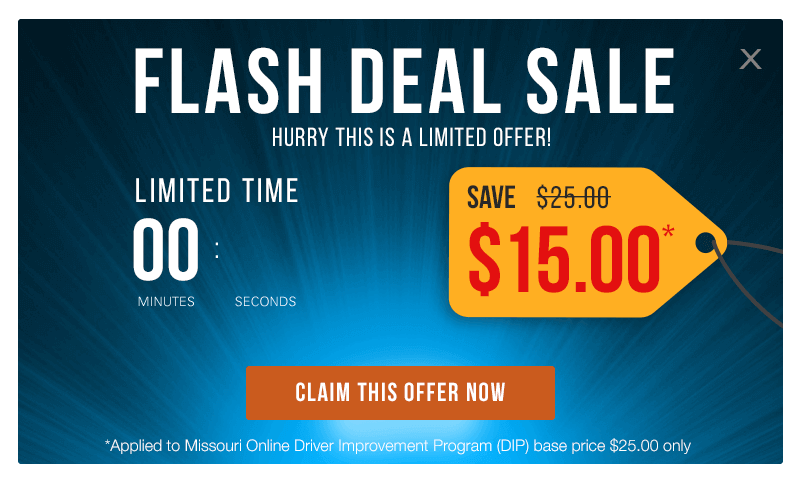 Select this course if you received a traffic citation for a moving violation and would like to enroll in the Missouri Driver Improvement Program (DIP) to avoid point assessment for the citation on your Missouri driving record or if you were ordered to take the DIP by their Court or MO Department of Transportation. Select this Option if you were ordered by the court to complete a defensive driving course. Select this option if you were sent by your employer. Shortest course allowed by MO law. Complete at your own pace. Once you do, we will electronically report your completion to the Missouri Department of Revenue. Access your Missouri Defensive Driving Course anywhere, anytime from any device. Created by the famed Improv Comedy Club, our Improv Defensive Driving Course provides a convenient and cost-effective way to complete your defensive driving class online. Based on a simple notion that a defensive driving course doesn’t have to be dry and boring, our MoDOT Approved Course has undergone numerous studies which proved our edutaining approach is effective in reducing future tickets and accidents. We are pleased to be certified by State of Missouri for our Missouri Defensive Driving Course. View our certification. Proceed and complete the course all at once or a little at a time. There are 10 short chapters, 3-question review quizzes (no correct answers required, as quizzes are for review purposes only), and a 50-multiple choice question final (unlimited attempts to pass). Continue on any device at any time. 100% Money Back guarantee. Completions are electronically reported on your behalf to the Missouri Department of Revenue on a daily basis. There is no further action required, UNLESS you were court-ordered to take this course, then it is your responsibility to submit a copy of the certificate of completion to the court if ordered to do so. From students who took our Defensive Driving Courses in Missouri. This traffic school is proven to be worth your time! So check it out! I appreciated the ability to take the course at my own pace. Enjoyed the course very much. Information was presented in a way that made it very clear and easy to remember. I liked it much better than sitting in the Library for this course for 8 hours. With only 1/2 hour for lunch. I took it in between babysitting my grandchildren and I didn’t have to give up my Saturday! Awesome course! So much fun! I really learned a lot. I think it was a good thing I got a ticket (minus the ticket expense)…but maybe I needed to be more informed as a driver. Thank you! I like it and found some great comedians I have never heard of before. This course is great I just really hope I don’t have to take another one ever! But if I do I will do this one again! I have a very busy schedule so it was awesome to have this option. Thank you! This was so much better than attending an all-day boring class! Easy, fun and educational all at the same time. Despite preconceived stereotypes of traffic schools, this course was actually an exciting experience. I really enjoyed taking this course online especially due to the fact of having 4 children and not needing babysitters. The kids also enjoyed looking over my shoulder and reading the jokes. I enjoyed the experience, particularly liked the appeal of being able to structure the class around my schedule. it was entertaining. This course was made simple, but very, very informative. It was humorous and very knowledgeable. I would highly recommend it to my friends and family. Thank you for providing a good learning module. It was convenient yet thorough and the design ensured the coursework was read effectively. It was a good refresher and a good way to learn. Very effective course. This course was very entertaining at the same time as informative! I will definitely recommend Improv Traffic School. Your variety made me want to keep at it each session. Thank You! I learned new things, and I’ve been driving for decades. WOW. I really enjoyed the format and I feel as though I learned a lot! GREAT JOB. Thanks for making learning fun! Excellent course. Educational and informing. Definitely recommended for anyone out there looking for an online traffic school course. What a terrific program! It definitely holds your interest and is simple to navigate and understand. Thank you!!! I’m definitely going to recommend this course to others should they find themselves just starting as a driver or in trouble because they have a ticket. I didn’t think it would change my way of driving but it sure changed my mind! I took one other driving test. My first one in 1953. I think it should be mandatory that people should take a test every 10 years. I enjoyed the course. The comedy made the course go faster and easier. Very enjoyable. MUCH better than the classroom course. I have been driving for at least 39+ years and thought I was a pretty save and good driver, but this course has shown me that there is always room for improvement, and also showed me a whole new way with respect for the law and other drivers. This was my first time taking any course for any reason “online” and I enjoyed it. It saved me money and a driving trip to the live course which was an hour away. Thank you very much. This is a great option for those who can’t make it to the classroom. As i was watching the course, I realized I have never known safety awareness before... even though i have been driven for several decades! This class is serious, honest, and very important for all drivers. This was an excellent idea. It is a good idea for working people who can’t take time off to sit through the class. I really enjoyed this class. earn discounts on car insurance premiums. make added points to your Missouri Department of Revenue a moot point. satisfy traffic court and/or MoDOT requirements. In some instances, traffic court may allow completion of alternative courses to dismiss associated driving record points. Even if such training won’t serve your finances or current driving record, given your situation, surely you benefit from learning about passive driving techniques that could save you from future incidents resulting in ticketed violations or costly accidents. These training courses may affect your driving record points, but they will not dismiss your actual traffic ticket. Missouri Defensive Driving courses may be used once every three years to avoid driving record points. Courses must be completed within 60 days of conviction. In some cases, insurance discounts may apply only to teen or senior drivers. You may be allowed to re-take a failed final, but this depends on the test provider. Once you have passed, you will need to submit the results to the Missouri DMV, traffic court, and/or your car insurance provider. Missouri Defensive Driving is a beneficial class to people who are seeking to improve their driving skills and/or records.